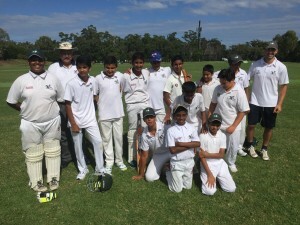 Australian Kfarsghab Association | AKA Crusaders defeat Kellyville in Junior Cricket Grand Final! Kellyville won the toss and elected to bat. The Crusaders bowled beautifully and far in advance of what could be expected of an under 13 team. Kellyville were dismissed for 63. Of note was the Crusaders bowling 18 maiden overs. Best bowler was Susrith Vasameti who returned the remarkable figures of 4 wickets for 16. Yash Patel was the next best bowler with 2 for 6. The Crusaders went in to bat and at the close of play in Saturday lost one wicket for seven runs. On Sunday morning it was all one way traffic. Susrith was not out for 35 and Yousuf Rehan scored 24. Both batsmen were in when the winning runs were scored. In the end, it was a dominant win to the mighty Crusaders. For Coach Simon Boulous it was a fitting end to his 33rd year of coaching, ably supported by promising Assistant Jake Abraham. Below is a photograph of the victorious Under 13’s AKA Crusaders. If you don’t recognise any of the Juniors, that’s because the AKA Crusaders is a community sports club and accepts registrations from anyone in the area. This year, there happen to be no Kfarsghabi youth in the under 13’s side….perhaps that may change next season?